Under The Heavens Sailing is a new company established in 2016, that already showed within first season its growing potential and affirmed itself as the splendid choice for sailing enthusiasts. The founder of the Under The Heavens Sailing, Vadym Ievstafiev as a passionate sailor and lover of comfort yachts, has been trying for years to find a suitable offer for the perfect sailing holidays. As his expectations haven’t been always fulfilled, the need for a reliable sailing partner has grown into the idea of starting his own business. After 20 years of experience in food industry, Vadym decided to found a charter company, provide the best service for both agencies and direct customers and give them a possibility to book the excellent yacht for the adequate price. In spite of being newcomers on the market, Under The Heavens Sailing is managed by the skilled professionals with a remarkable experience in the yacht charter business. In addition to exceptional knowledge, team is characterized by the friendly spirit and a sense to meet customer’s expectations. As the company booking manager Maja Šironja has pointed: ‘We like to work with clients and we always go one step further to please them.’ This vision drives Under The Heavens Sailing team, intended to ensure the unique sailing experience for their customers. Based in Primošten, they offer the fleet exclusively consisted of brand new Dufour sailing yachts ranging from 45 to 56 feet, which makes Under The Heavens Sailing an excellent starting point for discovering the beauty of the Croatian Adriatic coast. Besides the luxury equipped fleet that guarantees ultimate comfort and sailing performance, unique extra services are available such as boats being licensed for worldwide sailing and having one way possibilities to other countries such as Italy. Under The Heavens Sailing pride themselves on professional and trustworthy crew members, whose knowledge range from the art of sailing to the gastronomy and oenology, highly motivated to provide the best service from the beginning till the end of the sailing holiday. Since the charter industry has flourished for the past years and many investors have noticed its potential, Under The Heavens Sailing has recognized the opportunity and created a charter management program which allows a potential partner to purchase a sailing yacht and profit from their common interests. Back at the very beginning, as the unknown company on the global market, Under The Heavens Sailing needed a powerful solution for market positioning. From that point, they have recognized Booking Manager as the essential part of their success strategy. Besides instant access to worldwide agencies, the System enabled Under The Heavens Sailing to automate office tasks while leaving them enough time to focus on the client’s expectations. Determined to reach the full potential of the company, Under The Heavens Sailing team has chosen Booking Manager as the primary system to promote themselves and make business easier and more profitable. 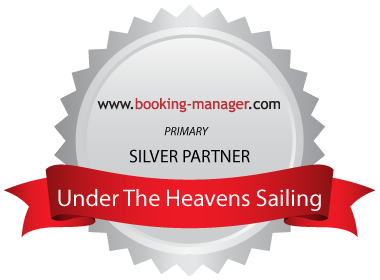 As the Booking Manager Silver Partner, Under The Heavens Sailing enjoys the benefits of additional promotion on the world largest charter market and lower operational cost. By using advanced Booking Manager tools, Under The Heavens Sailing is constantly increasing business efficiency and improving position on the market. For more information visit Under The Heavens Sailing website.